A global financial crisis bigger than the one in 2008 is conceivable in five to 10 years. 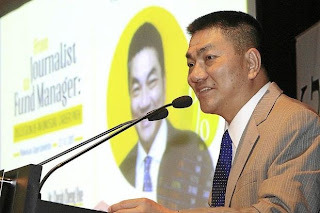 Value Partners Group chairman and co-investment officer Cheah Cheng Hye said the crisis, which would not be V-shaped in nature, would bring about capital flights, volatile markets, rising inflation and social unrest. “The global financial crisis would have to do with the very serious deficits that cannot be financed. Developed and developing countries have over the years accumulated such deficits by making promises that cannot be realised in order to get re-elected. “These deficits would sow the seeds of future social and political unrest,” he said at a public lecture entitled From Journalist to Fund Manager, which was officiated by Penang Chief Minister Lim Guan Eng. Also present was Penang Institute chief executive officer Zairil Khir Johari. On Malaysia, Cheah said Value Partners was not bullish about the country. “Malaysia’s Government and household debts are higher than those in Indonesia, China and Thailand. Half of the country’s government bonds are held by foreigners, who would be the first to run in a crisis. “The Malaysian workforce is now less productive than the workforce in Thailand and the Philippines. Malaysia is also importing more oil than selling it,” he said. On making investments, Cheah advised investors to have well-diversified portfolios. “They should have investments in gold, real estate and a high level of cash of at least 25% of their savings to prepare for future uncertainties,” he said. Cheah attributes his success to being at the right place at the right time more than the decisions he chose to undertake. Born in Penang, Cheah, 59, has been dubbed the “Warren Buffett of the East” by the media in Hong Kong.